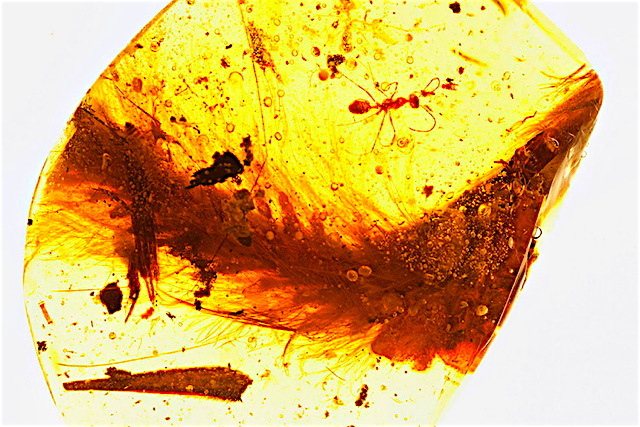 "As roses might in magic amber laid"
First Dinosaur Tail Found Is Preserved in Amber and Covered in Feathers: The piece—which is about the size of an apricot—had already been partially shaped into an oval by a jeweler. The Creation maybe mysterious in that much is yet to be revealed, but is not a secret. It is pervasive and profound. Just look around. If you wish to see the dinosaurs, look up. It has feathers and looks like a birds tail. Why do they think its not a bird? and raindrops fall weeping as our own time wanes.